Travis Blackstone (Lamas) is a man whose name tells you he means business. He works in a salvage yard working on trucks and being as manly as humanly possible. Because he has a sweet side, he coaches little league in his spare time. The problem is, he used to be a cop, but when he destroyed evidence to protect his annoying brother Franklin (Cheyne), he went to prison and was kicked off the force. Now that pesky Franklin is at it again, owing five million dollars to an underground criminal syndicate populated by baddies Jimmy Chang (Son), Baggy (McKay), Lee (Rhee), and the sadistic enforcer Toots (Zito). As if all this wasn’t enough, Travis’ girlfriend Lindee (Kates) believes he is cheating on her with former love Rhonda (Thorn) so Lindee, in an unjustified act of female revenge, works with the baddies and helps them find Blackstone. Now the stage is set for the ultimate confrontation. Will Travis Blackstone clear up all the BAD BLOOD? Lorenzo Lamas is truly the man we love to love. As far as we’re concerned, based on what we’ve been viewing lately (his 90’s action output), his star is in the ascendant. We believe he is underrated and underappreciated. He always has a cool quip, some cool Martial Arts moves, is handy with guns, and lest we forget his luxurious hair. What more can the man do to win you over? Here, every time he executes a cool move, there is a corresponding musical sting. Sure, his southern drawl may go in and out, but he pioneers the art of “Brickfighting” - and whether by accident or design, Travis Blackstone can defy gravity. Like how if you were on another planet, you would weigh much less, Travis seems to have less gravity in his body. Maybe he’s from another planet. Just check out the infamous “super jump” (Thank you to DTVC for the hotlink to the pic below) around 64 minutes into the movie. Plus, he’s equally adept at playing jazzy piano as he is beating up baddies at the drop of a hat. 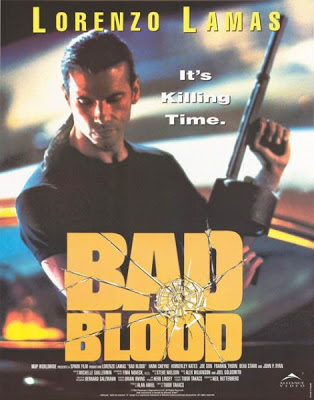 Another nice thing about Bad Blood is its cast of B-movie names. A standout is Joe Son, who also appeared in Shootfighter (1993), Shootfighter 2 (1996), Bloodfist V (1994) and Army Of One (1993), among not too much else. Even though he’d been in a bunch of things we’d seen, it took until us viewing this to really notice him, but to be fair his part is more substantial here. Cole McKay finally gets a decently sized part after all his great stunt work, while Simon Rhee’s part is not too big. Cheyne was good casting as Lamas’ brother, that does certainly look possible. And we didn’t even mention John P. Ryan (of Avenging Force (1986) and Delta Force 2 (1990) fame as their father) and Sigal Diamant (who also appeared in Shootfighter and Army of One, as well as other Lamas vehicle Blood for Blood (1995). The list goes on and on! Also we noticed Gordon Hessler was second unit director, who is a great director in his own right, having done the Sho Kosugi movies Pray For Death (1985) and Rage of Honor (1987), as well as the underrated Out on Bail (1989). The final warehouse shootout certainly gives Hard Target (1993) a run for its money, and the many goons allow Bad Blood to deliver the action goods. The heroic music booms as Lamas proceeds to kill everybody. Just like he did in Blood for Blood. 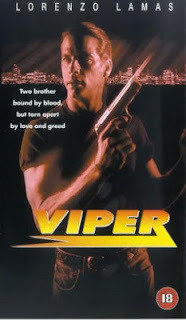 It’s a toss-up as to whether Bad Blood or Blood for Blood is the better Blood Lamas movie - but let’s not forget there is an alternate edit for this movie under the title of Viper. From what we’ve been able to tell, they’re the same except for a sequence of a baddie killing a kid was removed from the Bad Blood edit. So there are no other major differences that we know about. But seeing as how only one character calls Travis “Viper” only once in the movie, perhaps all references to that being his name were taken out, but we don’t know that for sure. Bad Blood is classic 90’s video-store action all the way and is a lot of fun to watch. We recommend it. Also check out reviews by our buddies DTVC and Cool Target! I've got this as Viper on an uncut UK disc (apparently Bad Blood is cut?). Need to watch it soon! That's awesome you have the uncut version. Bad Blood is cut unfortunately. Looking forward to your opinion. The movie rocks. Saw the uncut version years ago on Netflix. Basically, I'm saying that would be my dream job. That would be a killer job. Travis Blackstone is a rockin' name.